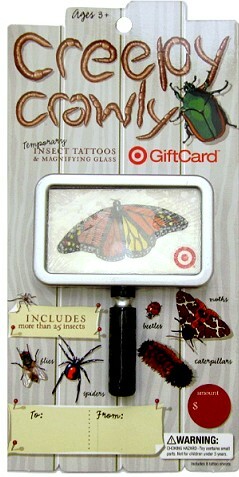 Creepy crawly gift card is too cute! This is super cute! Thanks so much! I could really use this for my up and up and up diapers! Totally Target you are the best, you help me get all the best Target deals…Thank you soooooooo Much! How cute – this is perfect for me!!!! Ohhh i would love to win!! Thanks for yet another opportunity to win! LOVE LOVE LOVE Totally Target! Thanks for all you do! Love this site!! I can never get the Target coupons to print on my printer.. any ideas? LOVE Totally Target on Fackebook too – that’s how i knew about this giveaway! This could help out the Easter bunny! “Liked” you a long time ago. . .”Love” you more everyday!!!!! I’ve liked you on FB and follow you. What a fun card…thanks for the chance! i just LLOOOOOOOVVVEEE TT !!!!!! I visit here EVERY.SINGLE.DAY!!!!! Thank you for the giveaways! This could help fill my kids’ Easter baskets! I would love this giiftcard!